First – the surface. It must be clean and smooth, nonporous. On the video you just watched it was a top of small table – painted with chalk paint and covered with acrylic varnish. Apart from decal itself (this one was of course created entirely by us) you need just bucket of water (but you can also use a sink basin instead), paper tissues and a optionally a ruler if you want to position the decal nicely. The decal which was used in the above footage can be purchased in our shop. Just visit Water Decal Vintage French Advert: Pret-a-Porter and voilà! it can be yours in no time. First step is to wet the decal thoroughly, make it soaking. The decal will roll up at the beginning, it is normal easy to unroll, so do not worry. 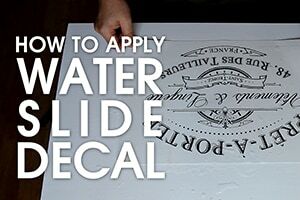 In the same time you can prepare the surface by sprinkling with water – it will make easier to slide the decal later. It takes the decal about half a minute to be ready for action. Just put it on the surface, unroll flat and then position in chosen place, perhaps using the ruler. When you find the perfect position, just slowly pull the sheet towards you, and then push back only the thin printed layer of the plastic (you must put your palms flat on the decal, trying to cover as much plastic as possibly – you are lucky if you have big hands). Repeat this action few times trying to align the two top corners with the place you have chosen before. In that time the bottom half of the backing paper supposed to stick out free. It should be easy then to remove it completely by carefully pulling out. In theory at least. The next step is drying up. Use the slippery back of the wet backing paper to wipe water from the surface. Then finish it off with a lot of paper tissues. When you think it is dry it is a time to start drying for real. Between our decal and the table is still a lot of water trapped. Your aim is to remove as much as possible necessary, and this is the most time consuming part of the whole process. Leave it overnight. Be patient. Cover with a coat of acrylic varnish or wax.